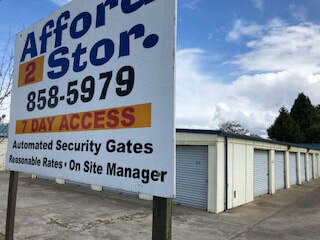 Centrally located in beautiful Medford, Oregon, Afford2Stor LLC provides convenient, affordable storage unit solutions. 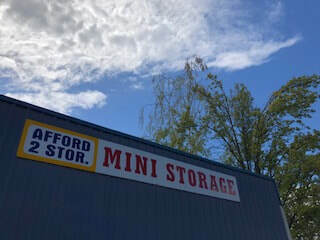 A family-owned business, our 80 secure units are affordably priced and range in size from 5x10 to 10x20 - perfect for all your self-storage needs, from clearing out extra office files to managing excess household and recreational inventory. 24-hour security including on-site cameras located throughout the site, on-site resident property management, locked fencing, electronic gate access and night lighting to ensure the safety of your property. 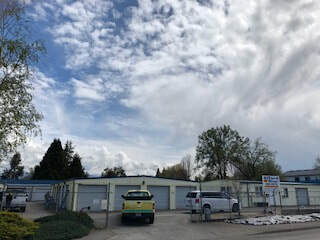 Call us at 541-858-5979 to book your self-storage unit and you'll find out why we are the friendly low-price leader in the Medford area. Visit us at 1315 Beekman with office hours, Monday-Friday, 1-3 pm, and by appointment. Located just 10 minutes from the Medford airport, head southwest toward Biddle Rd., then turn left at the first cross street onto Biddle Rd. Turn right on E. McAndrews Rd., then left onto N. Columbus. Left on W. Stewart and right on Beekman, we are on the left hand side at 1315 Beekman. Afford2Stor has been a family-owned business in the Medford area for more than 20 years. We offer competitive rates and secure self-storage units to support all your storage needs along with regular promotions and convenient terms. Call us at 541-858-5979 to learn more about our special rates and promotions. We've upgrading our storage units with new siding, timely upgrades and a fresh new look! Come see what we have to offer.